I'm late once again, but here is my submission for Illustration Friday. I've been working on this digital piece on and off for a couple of days. I hate ironing and always put off doing it. So maybe that's why it took me so long to complete it! I use the dryer as my iron! VEry nice piece. I love the melon colored shirts! Very nice! Love how the muted palette contrasts with her black hair. Really stands out. Great work! 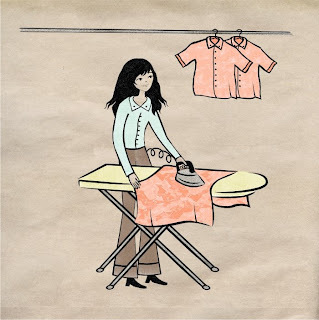 I hate ironing, too. It is so cumbersome. Wonderful illustration! I love the colors. Lovely work. I look forward to working with you, and seeing your work with Organic Dimension backgrounds.